We can expect a generally cloudy day today all across the south and not quite as mild as Wednesday. Still, mild compared to the seasonal normal. I'm keeping an eye on the overnight period for another band of freezing drizzle or flurries. It looks like there is a risk for the entire southern part of the province (south of the lakes) overnight into Friday morning. There is a perfect set up for freezing drizzle with warm air aloft and a shallow layer of below freezing air at the surface. That is all followed by clearing on Friday for a mainly sunny afternoon. Friday will also turn out to be a very mild mild January day. To the west, highs should be at around 2 degrees in the afternoon. Here in the Red River Valley and south, more like 4 degrees. The record high for Winnipeg on January 19th is 5.6 degrees. The weekend isn't quite as mild but still warmer than normal. Expect highs of -4 on Saturday and -8 on Sunday. Thursday: SE @ 15/20 this afternoon. Friday: SW @ 20 in the morning. W @ 20 in the afternoon. Saturday: Light Wind in the morning. Light Wind in the afternoon. Sunday: SW @ 10 in the morning. Light Wind in the afternoon. Time to unzip the heavy coats and leave the toques in the car. We'll be in the -2 to -3 range all across the south as a ridge builds into the eastern prairies from the west. I'm tracking a weak low that is producing some freezing rain west of Manitoba today and pushing into the region later this evening. If that happens, it will track across the southwest this evening, then through the Red River Valley late evening and through the southeast into the early hours of Thursday. We may see some patchy fog Thursday morning but a sun/cloud mix the rest of the day. The mild temps stick around through Friday. After another risk of freezing rain here in the valley and southeastern Manitoba on Friday morning, expect our warmest day of the week on Friday, and a sunny afternoon. 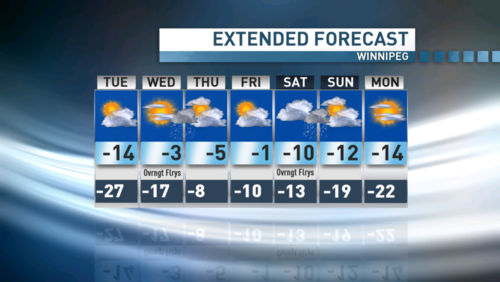 Some forecasts are going with a lofty 6 degrees for Winnipeg on Friday. I'm thinking more like 2 to 3 degrees for a high temp here in the southeast. The warmest air will be in the southwest. The weekend isn't quite as mild but still warmer than normal. Wednesday: SW @ 20/25 this afternoon. Thursday: NW @ 10 in the morning. SE @ 20 in the afternoon. Friday: SW @ 15 in the morning. W @ 20 in the afternoon. Saturday: N @ 10 in the morning. E @ 10 in the afternoon. Still a cool, breezy day but all of the extreme cold warnings around the province have been dropped. The wind is out of the south and will boost temps into the mid minus teens this afternoon. That kind of milder weather sticks around through Friday. There is a bit of a catch on Friday. I see a band of precip moving through around mid day that could turn into a band of freezing rain. I'll be watching the surface temps carefully. If we warm up quickly, we could rain instead. Tuesday: S @ 30/40 this afternoon. Wednesday: S @ 20 in the morning. W @ 15 in the afternoon. Thursday: SW @ 10 in the morning. S @ 10 in the afternoon. Friday: S @ 10 in the morning. SW @ 10 in the afternoon. Well, not exactly a tropical breeze! But it is a breeze that is blowing and drifting some snow. 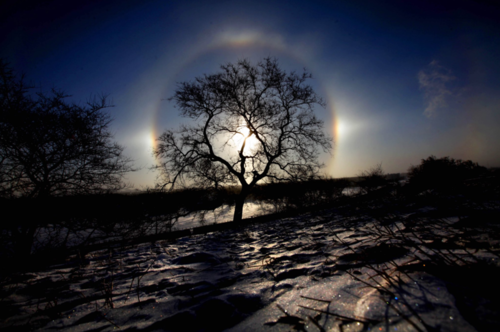 We also have a lot of ice crystals in the air creating scenes like this from Ruth Bonneville in Winnipeg this morning. If you have been outside at all today, you don’t need me to tell you it’s bitterly cold out there. Dangerously cold actually if you aren’t protected. The good news is, this is the last really cold day of the work week. Tuesday moderates back to seasonal (-14) with a southerly surface flow developing. By Wednesday, we are in the -3 to -5 range in the afternoon and that kind of milder weather sticks around through Friday. The weekend isn’t quite as mild but still closer to the seasonal normal, which is a lot warmer than today. Hang in there and cover the skin if you are spending any time outside today and tonight. Monday: NW @ 20/30 this afternoon. Tuesday: S @ 15 in the morning. S @ 25 in the afternoon. Wednesday: S @ 20 in the morning. SW @ 20/25 in the afternoon. Thursday: W @ 10 in the morning. S @ 20 in the afternoon. 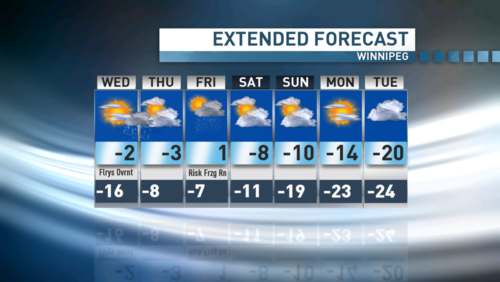 Friday is a similar day to Thursday with sunshine and temps close to -22 but the wind is much quieter. Saturday is also sunny with a high closer to -20 and not a whole lot of wind, but cloud rolls in late in the day and into the overnight period. Picking a day that is better to be outside this weekend will take some thought. Sunday starts with cloud, a milder -23 and some light snow. We’ll get to about -17 with a sun/cloud mix in the afternoon, but the winds shift and get rather gusty so it’ll feel a lot colder than -17. You may want to opt for the brighter, colder, less wind day on Saturday. That wind I was talking about on Sunday afternoon is out of the northwest and ushers in colder air again for the start of the work week. 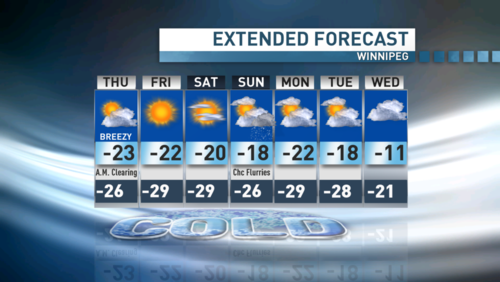 Monday is another bitterly cold day with a stiff breeze and a high of only -23. Wind chills will be high once again. It looks like the end of this current cold snap is scheduled for Wednesday with a high closer to -11. Then Thursday and Friday, temps are in the minus single digits. Friday: W @ 15 this afternoon. Saturday: SW @ 10 in the morning. S @ 15 in the afternoon. Sunday: W @ 10 in the morning. NW @ 30/40 in the afternoon. Monday: NW @ 20/25 in the morning. NW @ 20/30 in the afternoon. No surprise that the sunny, cold weather has returned to southern Manitoba. Winds are still strong and still blowing some of the new snow around in open areas. The Winnipeg area picked up 2-3cm of fresh snow, while south and east of the capital, it was more like 5-7cm. Expect High between -23 and -21 across the south today and we have extreme cold warnings in effect for the western sections of central Manitoba and, of course, the north. Friday is a similar day but the wind isn’t as strong. Saturday is also sunny with a high closer to -20 and not a whole lot of wind, but cloud rolls in late in the day and into the overnight period. Picking a day that is better to be outside this weekend will be a real head scratcher. It looks like the end of this current cold snap is scheduled for Wednesday with a high closer to -11. Then Thursday, temps are in the minus single digits. Thursday: NW @ 25/30 this afternoon. Friday: SW @ 10 in the morning. W @ 15/20 in the afternoon. Sunday: S @ 15/20 in the morning. NW @ 30/40 in the afternoon. Well, as expected, a cloudy and windy day in the south with tanking temperatures. We stared the morning at -4. As of noon, we were at -9 and should be right around -16 by 4:00 this afternoon. This low dropped between 14 and 16cm in Flin Flon, The Pas, and Cross Lake. 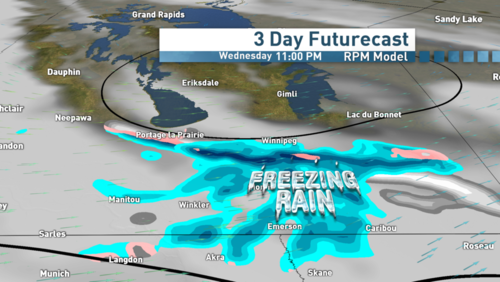 It also delivered a band of freezing from Dauphin through Minnedosa and into the Interlake regions. There’s a separate system dropping snow mostly south of the international border today and some of that may make north of the border later this afternoon and through the evening. Gusty winds will likely cause blowing and drifting snow outside city limits. By Thursday, the sunshine returns, but it’s very cold with a high of -23 and a breeze that may produce wind chills cold enough for another extreme cold warning here in the south. We have that extreme cold warning in the north today with highs in the -30s and wind chills that can freeze exposed skin in just a few minutes. Here in the south, that chilly weather (but without the wind) will last through the weekend. Wednesday: NW @ 30/50 this afternoon. Thursday: NW @ 30/40 in the morning. NW @ 20/30 in the afternoon. Friday: W @ 10 in the morning. NW @ 10/20 in the afternoon. Saturday: SW @ 10 in the morning. SW @ 20 in the afternoon.